In MPTM, IT and XM files, it is now possible to specify the song artist. The default artist can be specified in the settings dialog. In MPTM files, the default resampling can now be overridden. The dropdown box in the general tab is also accessible in other formats (so you can quickly change resampling without having to modify your normal playback settings), but won't be saved to the file. Decimal tempos (e.g. 123.45 BPM) can now be used in the MPTM format. Tempo Shuffle can be used in modern tempo mode to automatically increase or decrease the duration of individual rows of a beat to creat a shuffled / swing rhythm. Add Media Foundation (AAC, WMA, ASF, MP1, MP2, MP3, WAV-MSADPCM, ...) sample decoding support on Windows 7 and later. It is now possible to export to a sample slot rather than a file. 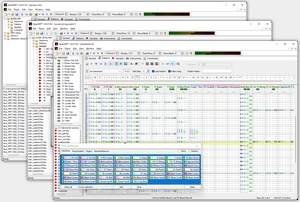 Experimental support for 14-bit MIDI controllers in the MIDI Mapper. Combinations of CC 0...31 and CC 32...63 now act as double-precision MIDI messages. I don't have a 14-bit MIDI controller, so if you can test this feature, feedback would be appreciated! A default module format or template to use when creating a new module can now be specified in the settings dialog. Hidden setting Misc.AllowMultipleCommandsPerKey can be used to allow more than one keyboard shortcut being bound to the same key combination (may do unexpected things with existing mappings with overlapping shortcuts such as IT-style "Play Row" on the 8 key, so beware). In the order list, it is now also possible to just copy the order list pattern numbers instead of their content. Added option for smooth (tick-by-tick) pattern scrolling. This is still somewhat experimental and consumes more CPU than necessary at the moment, but should be optimized in the future. Apply DNA and NNA settings to live note preview in patterns as well. Module instruments are now created automatically for newly added instrument plugins. Added hidden setting "VST Plugins.EnableAutoSuspend" which activates plugin auto-suspension for all plugins (later, this will be configurable per plugin). If a plugin didn't emit any sound during the last four seconds, its sound output is automatically suspended. Mostly useful for bridged plugins to save on process calls. When using the plugin bridge, MIDI events sent to 64-bit plugins or 64-bit OpenMPT do now work correctly. A few more plugins do now work correctly in the plugin bridge. Hovering the default and global volume fields in the sample and instrument editor now displays their attenuation in dB. Similarly, hovering the panning field shows its value in a more human-readable form. Added dropdown menu to New button for duplicating samples and instruments. Letters 'd' and '+' can now be used in note names of custom tunings. Instrument random variation is now applied to the velocity of notes sent to instrument plugins. Tremor (Ixx) is now also supported for instrument plugins. We do have a great bunch of interesting new example songs in this release, so go have a look at them in the Help menu! libopenmpt has been updated as well to reflect the latest improvements in OpenMPT. Oh look, I found a voluntary to dedicate all their spare time to port the complete GUI code! More serious answer: Yes, we are slowly working towards a state where the code will be easier to port. It will still take quite a while, though. I've been using this since 2004 for all music work, though I am not by far any good with my music, this has helped me get some music quickly and reliably made for verious hobby projects I do in my spare time for fun. I've yet to test out this new one, but I am hoping that my custom instruments using filter evelopes will sound right even if the sampling frequency is set above 44100hz. not sure what was going on there, timing issue probably. If there seems anything playing wrong, please do make a bug report on our issue tracker, otherwise we might never find out! Nope, I'm not aware of any timing issues with higher playback frequencies or instrument envelopes (the two things are completely unrelated, I wonder how there could be any timing issues between the two), so if you have any issues with that, please report a bug with a minimal testcase to reproduce the problem.